"UliManaMana, or UliMana for short, was incorporated on July 13, 2005 (a very good day astrologically) and may very well be the first raw chocolate company ever! Our first product Nirvana Manna, now called Maca Manna, was inspired by David Wolfe's book Naked Chocolate, and was first sold by Nature's First Law, now Sunfood Nutrition, in October 2005. It wasn't long after that when our five other products: Cacaoliente!, Chocolate Chai, Cacao Menta, Cacao Kava and Goji Manna were born, one after the other. (We couldn't help it! Our creative juices were flowing, thanks to all the psychoactive ingredients in the cacao.) Everything made with organic chocolate (cacao) and other vegan, organic ingredients. 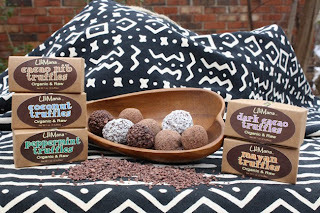 Most recently we created a line of raw, vegan, organic truffles that are basically sending the raw food community into Samadhi! (it's a yoga word that means Enlightenment or Bliss) Okay, so maybe I'm exaggerating a little. They are really delicious and selling like crazy. It's just hard to believe they're good for you too! 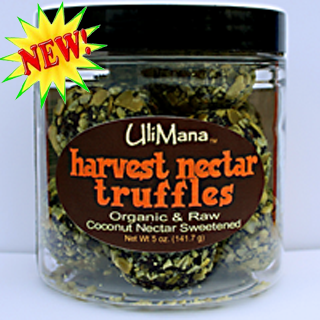 So praise the Cacao God, David Wolfe, and UliMana for these luscious, healthy, mood elevating vegan treats!" Raw & Organic Cacao powder, Coconut Nectar, Cacao Butter, Pumpkin Seeds, Raisins, Sunflower Seeds, Walnuts, Flax Seeds, Vanilla Beans and Celtic Sea Salt. What we thought: Okay, so I have never had raw chocolate before, so this was quite an experience for me:) I was a little surprised by the strong cocoa flavor, especially in the Harvest Nectar Truffles...I'm used to milk and dark chocolate which are definitely sweeter than the truffles we sampled. Both truffles were very nutty which was expected after reading the ingredient list. 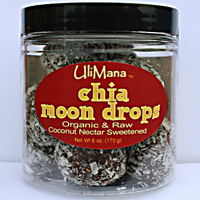 We did like the Chia Moon Drops a little better than the Harvest Nectar Truffles, though, again, I had never tried Chia seeds and they tended to stick around long after the chocolate was swallowed:) Definitely tasty though! The addition of Celtic Sea Salt was interesting, as it gave the truffles a slightly more salty than sweet taste. Overall, our first experience with raw, vegan chocolate went pretty well and we are definitely interested on trying other flavors:) ABCD Diaries gives UliMana a B+! Buy It: You can find raw chocolate treats at UliMana. 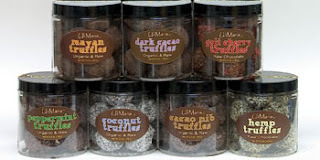 Disclosure: ABCD Diaries was given a samples of UliMana chocolates for review purposes only. We were in no other way compensated. The opinions expressed in this post are ours and ours alone.